Welcome to this week's Melbourne events, exhibitions, sports and community guide for March 3 - March 9, 2008. This week, it's time to get wet and wild with Melbourne's Moomba Waterfest! The Long Weekend also has much more to see and do with Flemington's Festival of Racing, the Melbourne Queer Film Festival, L'Oreal Fashion Festival, and if you have the weekend free there's also the Jazz Festival at Inverloch! Brunswick Music Festival continues also, and be sure to get your fill in the last week of Melbourne's Food and Wine Festival! Melbourne Moomba Waterfest, the heart of Melbourne's event calendar, enters its 6th decade when it begins on Thursday and runs until Monday over the long weekend. With all the favourite events that Moomba's known for, it features the Moomba Parade, the Birdman Rally, free entertainment, food, music and much more with new additions that include a live performance of the hit SBS show, RocKwiz! Melbourne Queer Film Festival, held from March 5th to 16th, is the largest and longest-running queer film festival in Australia, and also the second largest film festival in Victoria! Screening the best films from the gay and lesbian community both in Australia and around the world, the festival is held at ACMI Cinemas and ACMI Screen Pit, with several gala events taking place at other venues in Melbourne. L'Oreal Melbourne Fashion Festival, held this week, is Australia's largest and most successful consumer fashion event. Running until Sunday, the Fashion Festival showcases this year's autumn and winter collections of Australia's leading designers and brands. A pivotal event for Australia's fashion industry, it's one of few fashion festivals that feature many events that are available to the general public. Brunswick Music Festival begins on Wednesday, celebrating its 20th year with three weeks of music and entertainment featuring some of the finest performers from around the world. One of Victoria's most celebrated multicultural events, the Brunswick Music Festival highlights the diversity of the City of Moreland, one of the most culturally rich communities in Australia with 35% of its residents born overseas. The Melbourne International Motor Show begins on Friday, showcasing the latest in design and technology, futuristic prototypes, concept vehicles and more auto attractions than you could shake a dipstick at! Held at the Melbourne Exhibition Centre, the Motor Show will run until March 10th with exciting demonstrations, entertainment for the whole family, and even a vintage and classic vehicles auction. Melbourne Food & Wine Festival - Loosen your belt because one of Melbourne's best loved festival returns for it 16th year! Running until March 8th, this year's festival is bigger than ever before with over 200 events to tempt your tastebuds, celebrating Victoria's diversity in both food and culture. 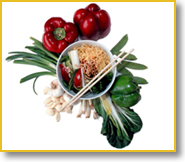 With everything from special dinners and wine tastings to kids' events, cooking classes and more! ChillOut Festival, the largest gay and lesbian festival in regional and rural Australia, begins on Friday, bringing fours days of fun, music and entertainment to the town of Daylesford. With art, sports, shows and exhibitions the festival has something for everyone! Ballarat Begonia Festival offers an incredible range of attractions for all, held across the long weekend. With the begonia exhibition as a highlight, the festival also features free kids' activities, music and art in Ballarat 's Botanical Gardens and Lake Wendouree's foreshore. The Festival of Spirit, held at Abbotsford Convent this weekend, is designed to suit everyone from the seasoned healing enthusiast to those who are new to alternative therapies and people of all ages simply looking for fun and entertainment that's different! Power and Beauty - Indigenous Art Now, is showing at the Heide Museum of Modern Art. With works from contemporary Aboriginal and Torres Strait Islander artists in all areas of Australia, the exhibits attest to the artists' resilience in holding on to their culture. Me, Ray Charles & Sammy Davis Jr - 'Movin' Melvin Brown, a performer from Austin, Texas, will be performing this week at Chapel Off Chapel. One of few true song & dance men, Melvin impersonates the greats such as Ray Charles, Otis Redding and more! Katie Noonan, known for her captivating voice, will be performing with the Australian Chamber Orchestra on both Sunday and Labour Day at the Arts Centre. The performance explores English song, including work by Lennon and McCartney. Emerging Playwright Forums allows writers to showcase work yet to be shown with rehearsed readings, and also gain audience feedback on the plays. With a reading this week of Tom Conyers' work Magpies, entry is by donation with food and drink later. Bazaar & Rummage, performed at Heidelberg theatre Company, is a play written by Sue Townsend, author of the infamous 'Adrian Mole' books. Set in a London church hall, the poignant, funny play tells of an agoraphobic group's efforts to rejoin society. Keating! - 'the musical we had to have' - will be playing at the Melbourne's Comedy Theatre for a strictly limited season. One of the most talked about Australian musicals in years, the play cheekily follows the rise and fall of its namesake with hilarious lyrics! Inverloch Jazz Festival celebrates its 15th year with a weekend of top class jazz from as many as 80 bands! Set in the beauty of South Gippsland, the festival includes free events such as the Saturday morning street parade, and Labour Day's 'Picnic in the Park'. Emaar merges the song writing and production talents of Melbourne's Upacci (Robert Upward and Matteo) and the soaring vocals of Ellie Henderson. Crossing electro-pop, dance and many other genres, they will be performing on Sunday at Eurotrash Bar. Future Music Festival serves up cutting edge electronic music on Sunday with a huge line-up of electronic musicians and bands from across the globe. Featuring stellar performers like The Chemical Brothers, it takes place at Sidney Myer Music Bowl. Nissan Moonlight Cinema is Australia's favourite summer outdoor cinema screening recent, classic and contemporary films in the Royal Botanic Gardens' stunning parklands! This Wednesday, the Australian hit, Romulus, My Father is screening. The Rooftop Cinema at Curtin House flickers into action all Summer, with films screening Tuesday to Sunday. Enjoy the night lights, classic cinema and the rooftop bar! This Thursday... Classic Elvis with Jailhouse Rock. Than'yew'veramuch! A Taste of Slow, traditionally held in winter, will this year be held to coincide with Melbourne's Food & Wine Festival. With a philosophical slant on the food we eat, the festival features spoken word, film and of course lots of delicious food! The festival runs until March 8. Held at Flemington Racecourse between March 5th and 15th, the festival's highlights include group racing, a family day, and special dinner events with guest chefs. GazzaNationals, Australia's hugely successful customized car festival, heads to Calder Park raceway this weekend with a fuel-packed program for Melbourne's motoring fans! Special guests include burnout champions Gary Myers and Clint Ogilvie. Tickets available at the gate on match day. 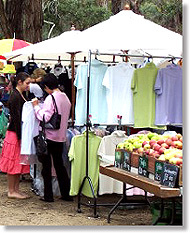 Avenel Produce & Craft Market is held on the 2nd Sunday of each month. Only an hour's drive from Melbourne, the market offers fresh produce and wine, plants, jewellery, crafts and much more. While there you can even squeeze in a shiatsu massage! Marking International Women's Day in 2008, there will be an evening of celebration on Thursday with guest speakers and entertainment throughout the night. The event is FREE, but must be booked by Tuesday. There are 5 Differences between these two pictures of the Heide Museum of Modern Art... See if you can spot them! Read More about the Heide Museum | Learn More about Melbourne! The Name's Theatre... Sun Theatre.. The Sun Theatre in Melbourne's west first opened in 1938. After many changes that included a stint as a Greek cinema in the 60s, and closure during the 70s, still stands today as one of Melbourne's numerous theatres that honours its original art deco architecture. The world's first National Jug Orchestra performed in Melbourne at the Much More ballroom in 1972. Jug players from all around Australia attended. I'm assuming it was a performance that was meant to blow!